Once again, everyone freaked out over nothing. For starters this movie wasn't bad at all; it just wasn't. Second, this movie wasn't meant to redefine the genre or what superhero movies are even suppose to be. 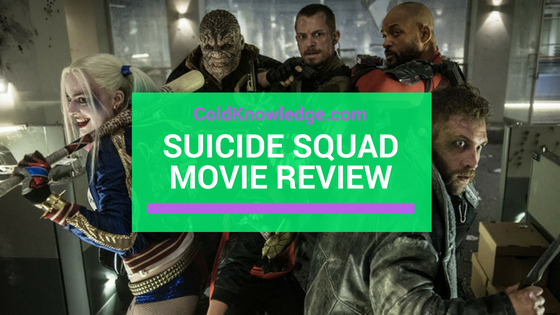 This movie was meant to be what it was, an action packed and cheap line movie that isn't like any other comic book movie out right now. Well I mean there's Deadpool, but still, this movie was worth the money that I paid to see it. For those people that say it sucked or wasn't up to par, just remember that when you're sucking on another Fantastic Four type movie, wondering where all of the action went. I think people like to either complain for no reason or just make stuff up just because it sounds good. Either way, you looked like some idiots for giving such a scathing review of a movie that was meant to be filled with action. Now that I go that out of the way I can get on with my movie review lol. The movie itself was solid, I liked a lot of the characters. Of course with Will Smith being the big name actor on the banner he would have spent the most time on the screen. I think that each character showcased what they could do effectively without overshadowing the other. They all had their big game moments in the film. I know that Joker was the focal point of the movie in terms of people either liking him or not. I, for one, can say that I didn't enjoy his performance too much. I know a lot of people grew up on that version of the joker from the animated TV shows and everything but I think he fell victim to the Heath Ledger effect with a lot of other folks. I want to see what he can do in the impending Batman solo movie; whenever that comes out. The dynamic of the cast really meshed well with each other. I know that I went in thinking they were going to tell a certain story from the comics about how they came together and everything and I can honestly say that I'm glad that they didn't do that. The plot was pretty on point, I just wish the villain wasn't such a pushover; but that's with all comic book movies to me though. The villain always gets diluted in these movies for some reason. Other than that the movie was a good starting point in terms of breaking people into the comic book world that doesn't know much about anything character wise. It was great seeing Flash and Batman in the brief moments that they had. That kind of thing sets up future roles for characters and I couldn't be more happy. Overall this movie was about action and introducing characters that you're going to see a lot down the road. I had zero problems with who played who in this movie, (other than the joker for obvious reasons), and I'm looking forward to seeing everyone down the line. Once again it's crazy to think that folks complained about this movie for no good reason. I don't know whether it was all of the joker hype and he wasn't in it that much or had anything to do with the ending, but when it's all said and done, this movie was the fourth best superhero movie of the year after Civil War, Deadpool and Batman v Superman. And for that I give it a solid B. If you saw this movie then let me know what you thought of it in the comments below.